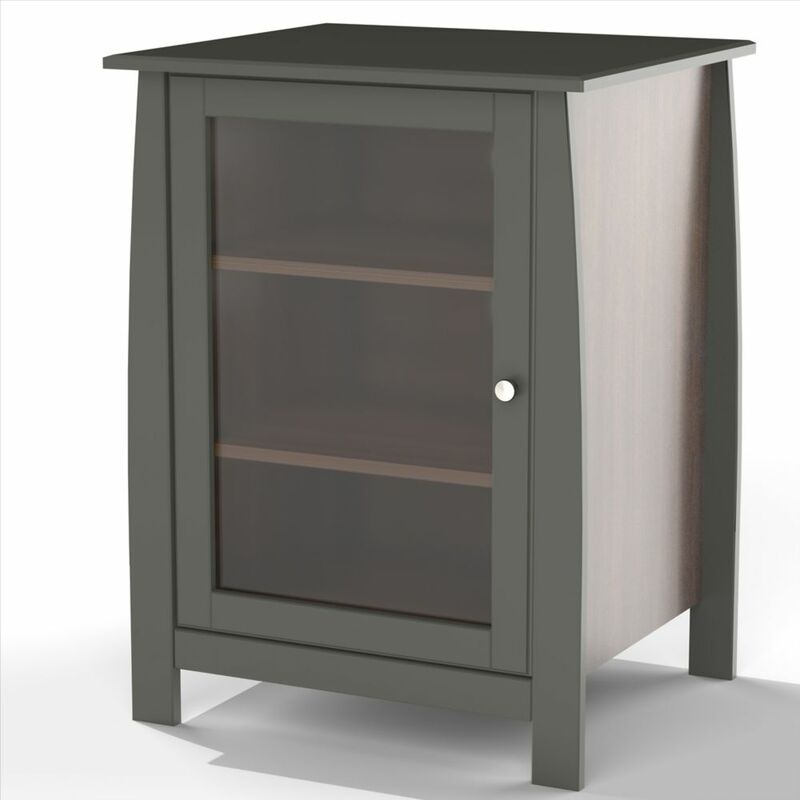 Profile 1-Door Audio Tower features 2 adjustable shelves and 1 reversible door opening from either right or left. Add this Profile Audio Tower to a matching Profile TV Stand #101117 or #102117 to create a complete entertainment set. The Profile Collection from Nexera offers 2 sizes of TV Stands and a matching Audio Tower in a rich Espresso textured lacquer and laminate finish. Within a compact space, choosing the right pieces of furniture is crucial in order to feel relaxed and comfortable. Maximize every square foot of your room with Bestar's Small Space units! It features 2 fixed and 3 adjustable shelves. The top and the bottom shelves are fixed. The doors can be installed between 2 of the 3 adjustable shelves for a unique design. If connected with the 19.5-inch Add-on Storage Tower, the doors can't be installed at the same height. Assembly Required. Ideal for movie marathon essentials or for your favorite potted plants, this TV stand with its modern yet cozy look is the perfect addition to your trendy & minimalist living room. This Marble collection 72'' TV stand offers open shelf areas, 2 drawers and a door with additionnal storage space. Paired with the Marble audio tower that offers open shelf areas and a door at the bottom for additionnal storage space and a complete living room set. The door panels have a modern twist with a linear construction detail that brings timeless depth and texture in a matte white lacquer finish. The Jasper Mobile Storage Tower from Nexera from Nexera is offered in a rich Moka and black finish with a simple and contemporary design. This audio tower offers convenient multi-purpose storage and is well suited for electronic devices as it allows for easy cable management and optimal air flow. The unit also comes with optional casters for added fonctionality and ease of use anywhere around the house. The Jasper Storage Tower in Moka and black can be paired with its matching Jasper 60-inch TV stands to create a complete entertainment set. Jasper storage and entertainment collection proposes flexible and functional pieces adding convenient storage where you need it the most. Profile 1-Door Audio Tower Profile 1-Door Audio Tower features 2 adjustable shelves and 1 reversible door opening from either right or left. Add this Profile Audio Tower to a matching Profile TV Stand #101117 or #102117 to create a complete entertainment set. The Profile Collection from Nexera offers 2 sizes of TV Stands and a matching Audio Tower in a rich Espresso textured lacquer and laminate finish. Profile 1-Door Audio Tower is rated 4.0 out of 5 by 1. Rated 4 out of 5 by jvjj from This is a good cabinet for the price I bought this for our AV devices. It is actually a much darker colour than the photos show - more like a dark brown, almost black, compared to the greenish colour in the photo. This was OK for me as it matched better. I did not install the backing because I wanted easy access to the rear of my devices. The cabinet is a bit wobbly but I think the backing might have helped with that. Otherwise, the cabinet was easy to install. All my devices fit nicely and the cabinet fits in the room well.